It's a bit of a renaissance out there when it comes to Static Site Generators. There's Jekyll and GitBook, Hugo and Hexo. Middleman and Pelican, Brunch and Octopress. There's dozens, if not hundreds of static site content generators, and "long tail is long." Static Generators a nice for sites that DO get updated with dynamic content, but just not updated every few minutes. That means a Static Site Generator can be great for documentation, blogs, your brochure-ware home page, product catalogs, resumes, and lots more. Why install WordPress when you don't need to hit a database or generate HTML on every page view? Why not generate your site only when it changes? I recently heard about a .NET Core-based open source generator called Wyam and wanted to check it out. 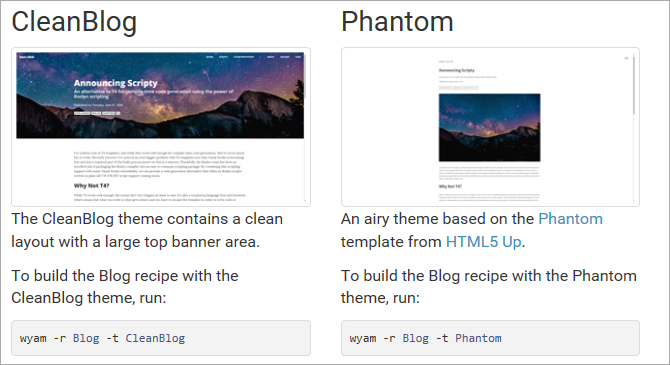 Wyam is a simple to use, highly modular, and extremely configurable static content generator that can be used to generate web sites, produce documentation, create ebooks, and much more. Wyam is a module system with a pipeline that you can configure and chain processes together however you like. You can generate HTML from Markdown, from Razor, even XSLT2 - anything you like, really. 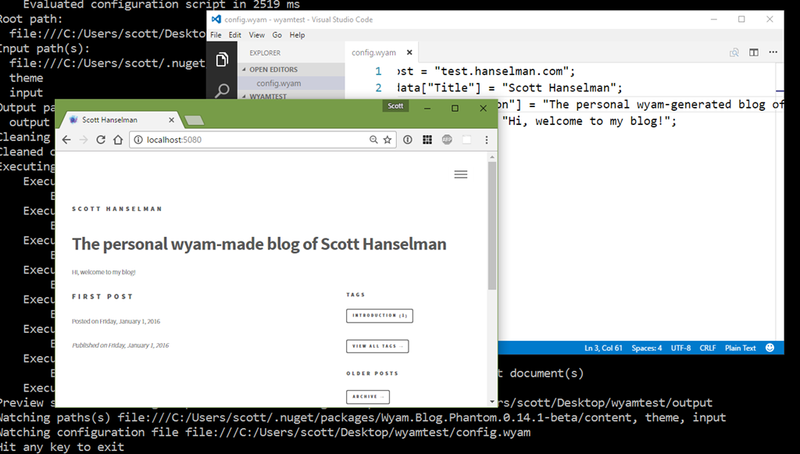 Wyam also integrates nicely into your continuous build systems like Cake and others, so you can also get the Nuget Tools package for Wyam. There's a few ways to get Wyam but I downloaded the setup.exe from GitHub Releases. You can also just get a ZIP and download it to any folder. When I ran the setup.exe it flashed (I didn't see a dialog, but it's beta so I'll chalk it up to that) and it installed to C:\Users\scott\AppData\Local\Wyam with what looked like the Squirrel installer from GitHub and Paul Betts. Wyam has a number of nice features that .NET Folks will find useful. Let's see what I can do with http://wyam.io in just a few minutes! One could imagine recipes for product catalogs, little league sites, etc. You can make your own custom recipes as well. If I'm working on my site a lot, I could run Wyam with the -w (WATCH) switch and then edit my posts in Visual Studio Code and Wyam will WATCH the input folder and automatically run over and over, regenerating the site each time I change the inputs! A nice little touch, indeed. There's a lot of cool examples at https://github.com/Wyamio/Wyam/tree/develop/examples that show you how to generate RSS, do pagination, use Razor but still generate statically, as well as mixing Razor for layouts and Markdown for posts. The AdventureTime sample is fairly sophisticated (be sure to read the comments in the config.wyam for gotcha) example that includes a custom Pipeline, use of Yaml for front matter, and mixes markdown and Razor. There's a TON of options. You could even use Excel as the source data for your site, generate CSVs from the Excel OOXML and then generate your site from those CSVs. Sounds crazy, but if you run a small business or non-profit you could quickly make a nice workflow for someone to take control of their own site! Wyam looks like a really interesting start to a great open source project. It's got a lot of code, good docs, and it's easy to get started. It also has a bunch of advanced features that would enable me to easily embed static site generation in a dynamic app. From the comments, it seems that Dave Glick is doing most of the work himself. I'm sure he'd appreciate you reaching out and helping with some issues. As always, don't just send a PR without talking and working with the maintainers of your favorite open source projects. Also, ask if they have issues that are friendly to http://www.firsttimersonly.com. Sponsor: Big thanks to Redgate! Help your team write better, shareable SQL faster. Discover how your whole team can write better, shareable SQL faster with a free trial of SQL Prompt. Write, refactor and share SQL effortlessly, try it now! Thanks for the write-up! For anyone who's interested in checking Wyam out, I'm happy to lend a hand and answer any questions you have here or over at the Wyam Gitter chat. Been using Jekyll and Hexo for quite some time and always thought it would be nice to have something more in the .NET space. Especially for piping data into these static systems. Thanks for the post, will investigate. I've loved Wyam since I found it last year. I had quite a bit of code included in one of the releases, in fact. There's literally nothing you can't do with it. Plus, Dave Glick is a hell of a nice guy. Had lunch with him in DC this summer. Thanks for this good piece of read. Just because I see .NET next to a static site content generator, it reminded me of the once open sourced Live Writer. I wonder whether they would be a nice company to each other. I moved to a static site a few years ago. I've used Pretzel, PieCrust and am currently using Jekyll with GitHub Pages. I love the simplicity and performance. Glad to see there is a .Net option. Pretzel is another .Net project I have used in the path although I don't think any of the current offerings have the polish of Jekyll or Middleman. I've been looking at these for a while. How do people do form processing for contact and feedback forms on static sites? Thanks. @Keith There's a number of services that help with forms processing for static sites. A number of them are listed here. There's also a new service called Staticman that will submit PRs on form submission. And Netlify (a static site host) has forms processing services as well. @Dave Glick - thanks great list. @Keith, there's plenty of solutions, such as http://liquidforms.io/. I'm planning to put together samples of how to do that for a few static sites, and would be happy to contribute to your /examples. Oh, and there is the issue of when to kick off the Indexing. With GitHub Pages I can kick it off with their Page Build webhook, but for others it would probably need to be handled in the build sometime after the deploy. I've used Pretzel, PieCrust and am currently using Jekyll with GitHub Pages. Snapback Caps I love the simplicity and performance. Glad to see there is a .Net option. @Pete Yes, embedding google is a workable option, and was very easy to setup. 1. The ux was a little harsh. User types in the search box, hits enter, gets taken to a google.com results page, then when they click on a result they get taken back to my blog. 2. I was dependent on Google's indexing, so new blog posts wouldn't be searchable for an indeterminate amount of time. But really, I'd be lying if I said I did the Azure Search/Azure Function integration for any reason other than to see if I could. yeah, Wyam does great job, its a great platform for programming and infact most of the static sites does Wyam as cms. Nice writeup, I will definitely have to look into it further. I'm moving a few sites to something like this, and this seems a little more what I'm looking for.